Calculate the impact the bond would have on your taxes. Enter the true and full values of your property and the yearly and monthly impact will appear in the table. Please enter the number only (do not include dollar signs, commas, or other symbols). If you do not know your true and full value you can find it on your tax statement. Here is a link to the North Dakota Property Tax finder. Simply go to the link, click on the county you live in and follow the prompts. After you find your true and full value type the number in the space below and hit return. Your yearly and monthly tax impact will calculated and displayed. Why are we having a Bond Referendum vote and how did we get here? The majority of our facilities were built in the 1960’s, and are now approaching 60 years old. In that time, our lives have changed significantly, and education has needed to change as well. 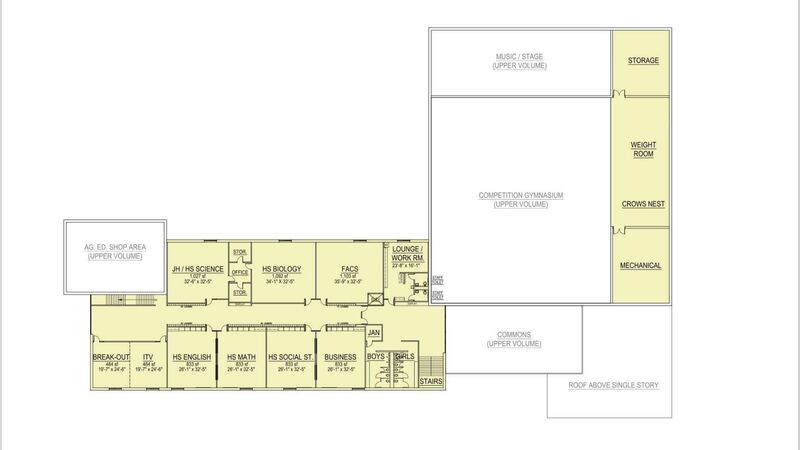 The condition of our High School has been especially troubling, so in 2014 the School Board hired an independent Architectural/Engineering firm to study the condition and expected useful life of both the High School and Elementary. That report recommended a phased replacement of our High School facility due to its structural condition, asbestos issues, outdated fire alarm system, lack of sprinklers, age/condition of coal boilers, kitchen Code deficiencies, water intrusion, plumbing issues, and lack of secure entry. The 2014 report also recommended significant improvements to our Elementary School, including more classroom space, appropriate special education space, asbestos removal, fire sprinklers, safety, intercom, parking, site drainage, and bathroom updates. How was the Community involved in the process? EngTech and Consolidated Construction Company were hired to work with the Citizen’s Committee to study possible solutions to our needs. A Capital Maintenance Plan was completed which indicated a need for $6.8 million in repair and replacement of building systems (i.e. structure, roofing, windows, plumbing, etc.) over the next 10 years. Repair and replacement costs would not address our current educational needs. A public meeting was held on February 28, 2017, and various plans/costs were developed with our Citizen’s Committee. The Committee asked the School District to consider other means of funding, in addition to local taxes. On May 11, 2017 the Three Affiliated Tribes awarded the Parshall Schools a $9,000,000 grant towards construction of a new PreK-12 School. After meeting several times from March through May, 2017, the Citizen’s Committee made their recommendation to the School Board on June 6, 2017. After careful consideration and discussions with patrons, the School Board called for a $5.4 million referendum vote to be held on August 22, 2017. The Referendum is for 28% of the total project cost, so what are the other funding sources? What are New Market Tax Credits? The New Markets Tax Credit is a program that provides funding for business and real estate investment in low-income communities of the United States. This program is a grant, and in addition to any other funding available for our new School. How many years to pay off the loan? The loan is for 20 years, the maximum time allowed by the Century Code. The School District is financing for 20 years to keep the local tax impact minimal, but the loan can be paid off early without penalty. What are the major changes in education since our buildings were built in the 1960’s? Increased focus on job skills including working in teams, problem solving, etc. How would a new School benefit our students? Would the new School be available for Community use? Yes, we want our School to be the hub of our Community. Currently, activities like the fall craft fair and summer meal program will continue. We could host open gyms, graduation/wedding/family receptions, offer vocational classes, early childhood and family education activities, and more. We welcome your ideas on how this new facility could be designed to benefit our Community. How do our local taxes compare with other School Districts our size? What is our current student enrollment and what is it expected to be in the future? Parshall School District currently serves 265 students in Kindergarten through 12th grade. Our enrollment has been steady over the last 5 years, ranging from 249 to the current 265. We project enrollment to range from 260 to 275 students through the 2021/22 School year and are planning for a Pre-Kindergarten program. How will this project affect our operating costs? There will be operational cost savings with one, new PreK-12 facility. New construction is more energy efficient, materials are more durable, there will be less time wasted in travel between facilities, and we won’t need duplicate spaces like kitchens. Other Districts our size that have combined facilities have seen operating cost savings in the $40-50,000 per year range. We also avoid the $6.8 million in basic building and safety need improvements identified in the Capital Maintenance Plan. Over the next 10-15 years, capital maintenance costs will be minimal in a new school. Rather than spend $6.8 million to repair the existing schools, we are asking the patrons to approve a $5.4 million investment for a new school. Over the next 10-15 years, capital maintenance costs will be minimal in a new school. Interest rates and construction costs will rise, making this project more expensive in the future. A 2% loan from the State is currently available, with voter approval of a referendum. The State’s low interest loan may not be available in the future. New Market Tax Credits are currently available for up to 20% of the costs. These funds do not need to be repaid and may not be available in the future. Finally – and most importantly – if nothing is done, our students would not gain the many benefits outlined earlier in this document. What is included in the bond referendum for technology? Improved technology access and integration into all learning spaces will be provided. Technology improvements include voice and data cabling, telephone system, intercom, master clock, and security systems. In addition, power supply and quality will be designed for the demands of today’s technology and equipment. Technology equipment will continue to be funded by our operating budget, and is not included in the referendum. Because technology becomes obsolete so quickly, it doesn’t make financial sense to buy technology equipment with 20 year loan proceeds. What will happen with our Elementary School? Various options for the building are being considered at this time. The district does not plan to demolish the building or allow it to deteriorate and become an “eye sore”. What will happen with our High School? 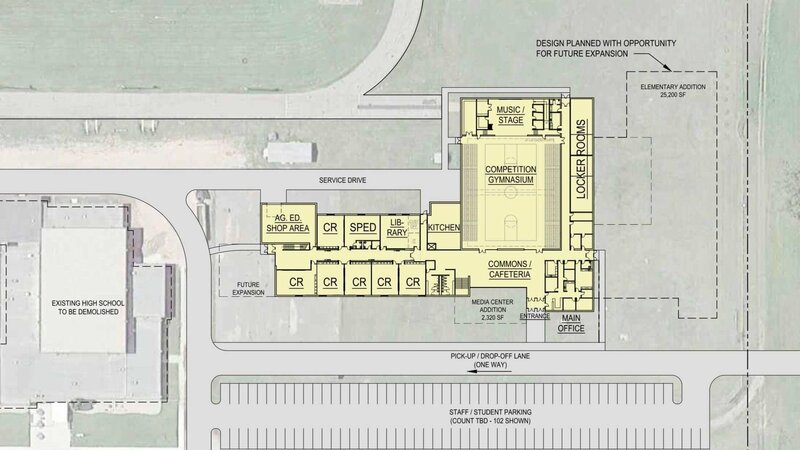 The current plan is to demolish the high school, following occupancy of the new school. How much room is there for future growth? We believe this plan is “right-sized” for current needs and allows for modest future growth. How much does the District save with the State 2% loan? Current bond rates are in the range of 3.4%. If the 2% State Loan Program was not available and the project were financed through a bond issue, approximately 2.6 additional mills would be required from local tax payers, which would be an additional cost of approximately $848,000 over the 20-year life of the bonds. What if construction costs are different than planned? Current construction costs are lower than we have seen in the last 3-5 years and are very competitive. 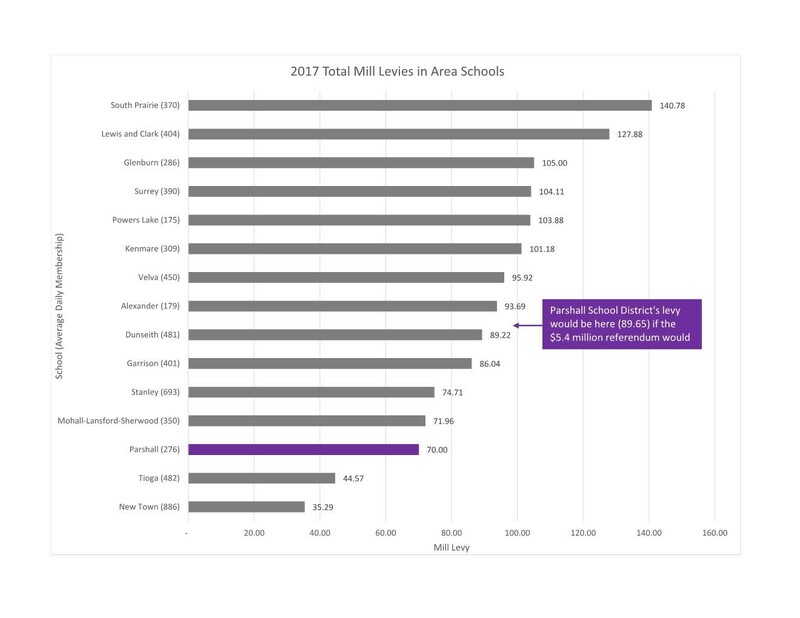 If bids are more than the estimated costs, the School Board will reduce the project scope and costs to keep the overall tax impact and mill levy at the amount estimated for the voters. If the construction costs come in lower than estimated, or additional funding becomes available, the School Board will borrow less money and lower the overall tax impact and mill levy accordingly. Will the project be up for public bid? Yes, our Construction Manager has been hired through a competitive bid process, and all construction work will be legally advertised and competitively bid. After final design is approved and satisfactory bids have been received, the Construction Manager will provide a Guaranteed Maximum Price for the project. When and where will voting take place? Voting will take place on August 22, 2017 from 7:00 AM to 7:00 PM at Parshall High School. Will early voting and absentee ballots be available? Absentee voting applications can be obtained at Parshall High School office Monday-Friday, 8:00 a.m. – 4:00 p.m. Absentee ballots are due to the School Business Manager by 5:00 p.m., August 21, 2017 or post marked no later than 12:00 a.m., August 21, 2017. 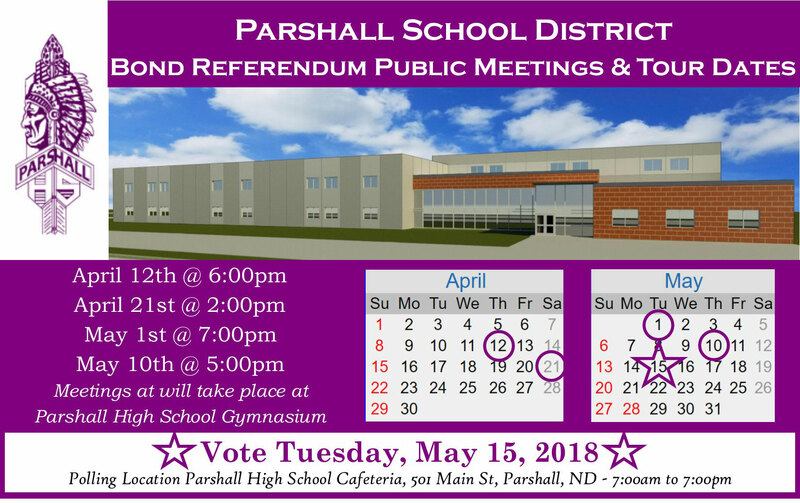 A legal resident of the Parshall Public School District for at least 30 days preceding the election. How can I find out more information? How can I get involved?